1Put the cipollini onions to boiling water. Remove them after 30 sec. Place them in a plate. Once the onions are cool enough to handle easily remove outside peel. 2Trim top of eggplant and cut lengthwise into 1/2” slices. 4Put all vegetables in a large plastic zip bag, add already mixed olive oil with salt and black paper and turn to coat well. Marinate for 15min at room temperature. 5Line a piece of baking paper on the oven rack and preheat the oven to 350 degrees. 6Place the vegetables flat, leaving 1” distance between them and then bake them for 20 min at 350F. 7When done, transfer the peppers and tomatoes to a pot, leaving the lid on until they are cool enough to peel the skin off. 8Cut the eggplant slices to 1” thick stalks. 9Mash the baked tomatoes in a glass bowl until smooth. Don’t use a food processor – it will change the texture of the spread and change the color to a paler red. 10Transfer the tomato spread into a glass serving bowl to enjoy the fresh red color of the roasted tomatoes. 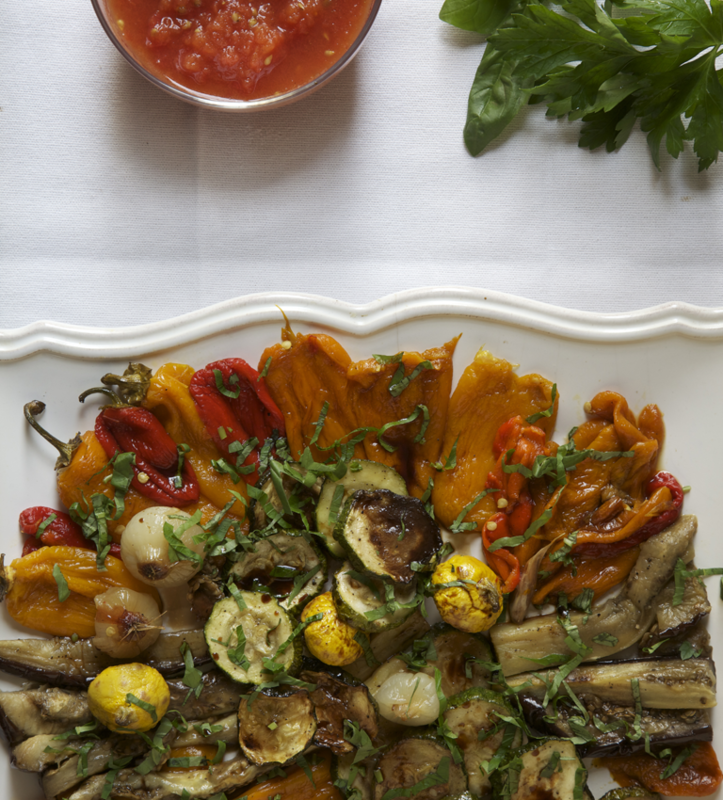 11Arrange the veggies on a platter and just before serving, pour some aged balsamic vinegar and diced basil & parsley. 12Serve with the tomato spread on a side.